Bubble wrap will often come in packages with delicate items. Instead of throwing it away or popping the bubbles, consider keeping it. Turns out it is a very useful item to have on hand, especially during the cold winter. Winters can become extremely harsh and cold. It can also get costly during this season as temperatures decrease and put strain on electrical costs. Bubble wrap is also very inexpensive to buy if you don't have any laying around the home. In the long haul it can actually help you save money. Here are some ways you can use it during winter. Window insulator kits are available however they can be quite expensive. For a cheap alternative cover your windows with bubble wrap and double sided tape. This will keep your home warmer and help lower electricity costs. Often time moms do not get to drink their coffee at a nice hot temperature. To help keep your drink hot for more than just a few little minutes, simply cover the outside of your mug or with bubble wrap to be able to enjoy your coffee, tea, or hot chocolate. Whether you need to keep a take away dish hot until returning home or want to take a hot meal outside keep it warm buy lining the dish with bubble wrap. There is nothing worse that discovering you have broken pipes which can leave quite a mess as well as expensive repairs. Cover a sheet of bubble wrap around pipes and tie with a string. This will help maintain the pipes temperatures and keep them from freezing/bursting. Place a sheet of bubble wrap over your windshield and tape it in place to keep that overnight winter frost away. Lightly wrap the outside of your plant containers with a sheet of bubble wrap to prevent damage caused by a harsh winter frost. 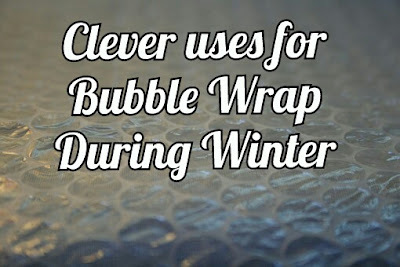 Do you use bubble wrap around your home during the winter? this is an awesome post. Keeping water pipes warm. That is genius! Love these tips. I love tip for keeping the coffee hot. I have never thought to use bubble wrap on my windows but with this cold weather we are having I am totally trying it! I have used bubble rap for my plants and it works well. Need to try the windshield tip. I never knew how useful bubble wrap was. I will certainly try some of these, they are awesome tips, sharing with my best gals now. Wow! This makes perfect sense because air is a great insulator! I usually keep it around because my husband (yes, we don't have kids) likes to pop it. I am going to share this on Facebook! This is so smart! I have so much bubble wrap from deliveries I'm looking to upcycle, so this guide is perfect inspo.